A mantel is a focal point in your home. So it is not only fun to deck it out for each season it is important to the look of the rest of your decor! 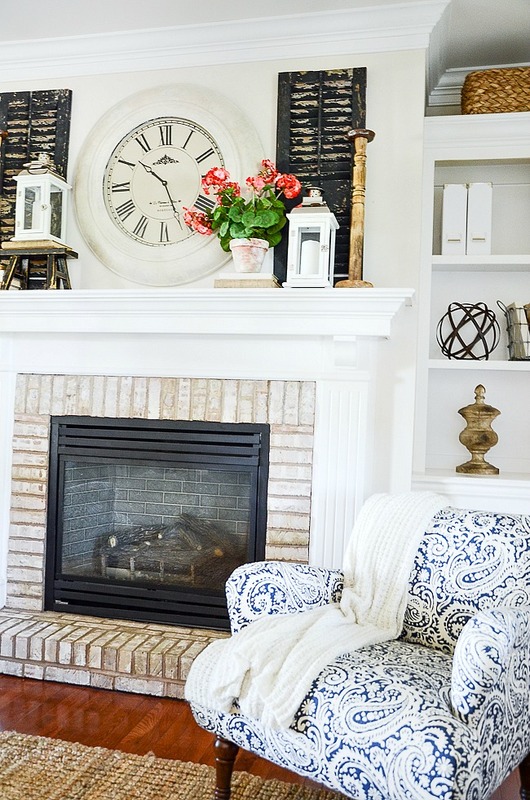 Summertime is easy and breezy and laid back and your mantel should look that way too! 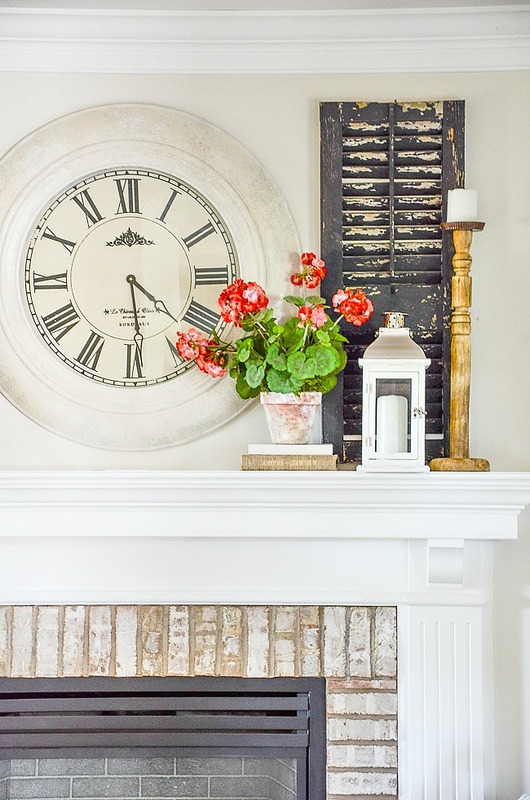 Here are a few secrets to decorating the best summer mantel! 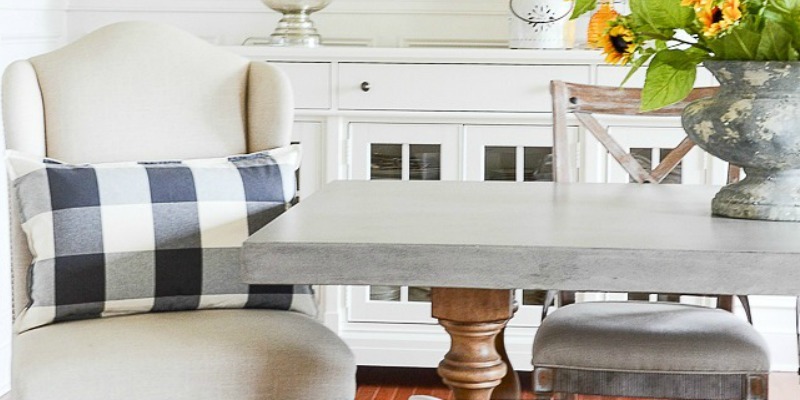 Today on Decorating Tips And Tricks we are talking about WAYS TO MIX WOOD TONES! What an important discussion! There is a whole lot to say these days about mixing glorious woods well! Let’s decorate our mantel for summer! 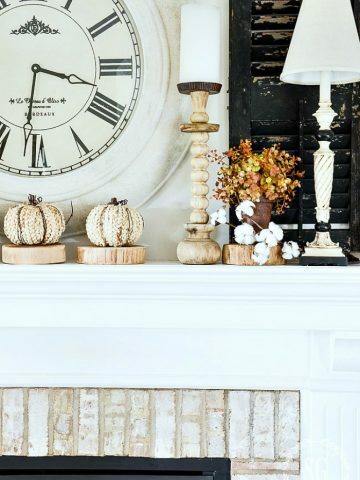 Don’t rush out and buy new things for your mantel or horizontal surfaces every time the season changes… shop your house! 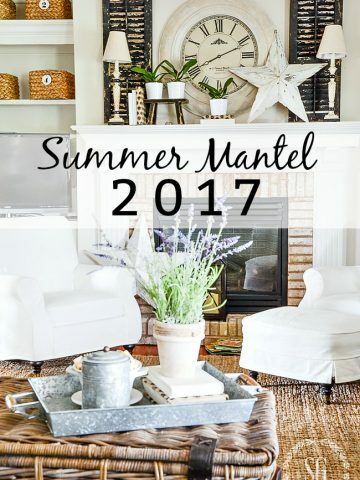 If you are like me you can probably find lots of goodies that will give your summer mantel a fresh look! Over my decades of decorating my home and others, I have learned to pick up things as I see them go on sale and collect decor items that work together. So I have lots of decor pieces that can be interchanged. I have a stash of burlap covered book and white painted books that are almost a must when I decorate. And for the mantel books work like magical risers! Shopping my house for things like a mantel or vignette is always fun and I often find forgotten items that I love. I think it’s important to bring a little bit of the summer season indoors. And my favorite way to do this is with faux flowers. I’ve said it a thousand times, “invest in fabulous faux” and they will not only look gorgeous but last for years! These geraniums have been kicking around in my basement for over a decade. And every other year or so I bring them back up and use them in my summer decor. Years ago I put them in faux aged terracotta pots. They have been so useful to bring a big punch of lipstick red to so many rooms here at StoneGable! large picture of flowers, greens, outdoor, birds, etc. This is so important for any mantel, any time of year! The space between the mantel ledge and the ceiling is prime real estate! And needs to be used. Make sure to have a “backdrop” of sorts that other items can be layered in front of. 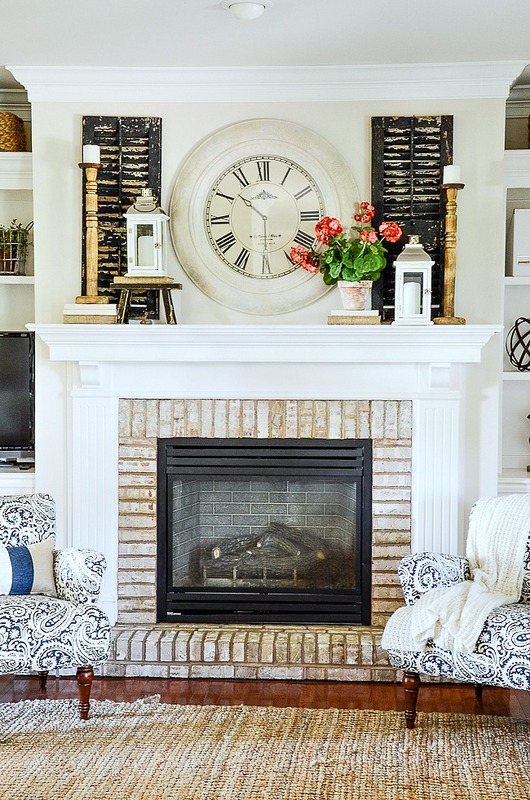 I have a large painted clock and some chippy shutters that are a mainstay on my mantel. I’ve used other things on the wall over the years but these items seem to work best and are my personal style. Creating a background for the rest of the decor on a mantel will be the one best thing you can do for an attractive focal point! Summer is all about color! Pick a color and add a pop of it to the mantel. 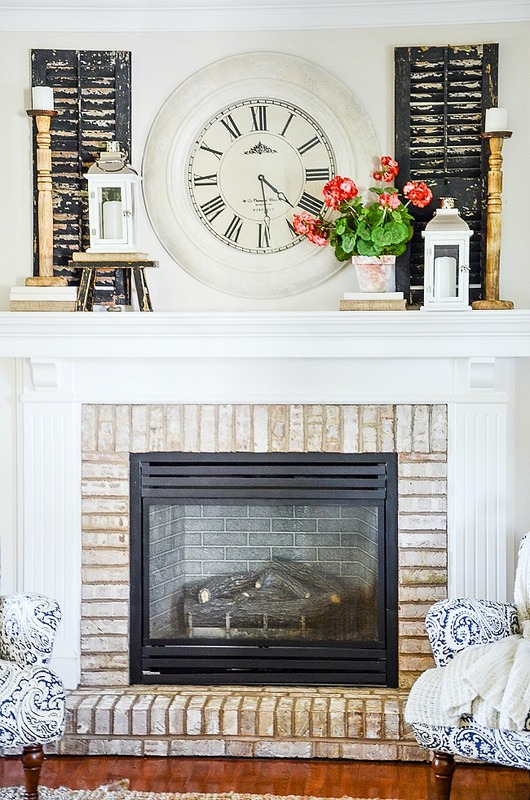 A mantel is a focal point so you want to bring attention to it. And our eyes and mind love color! 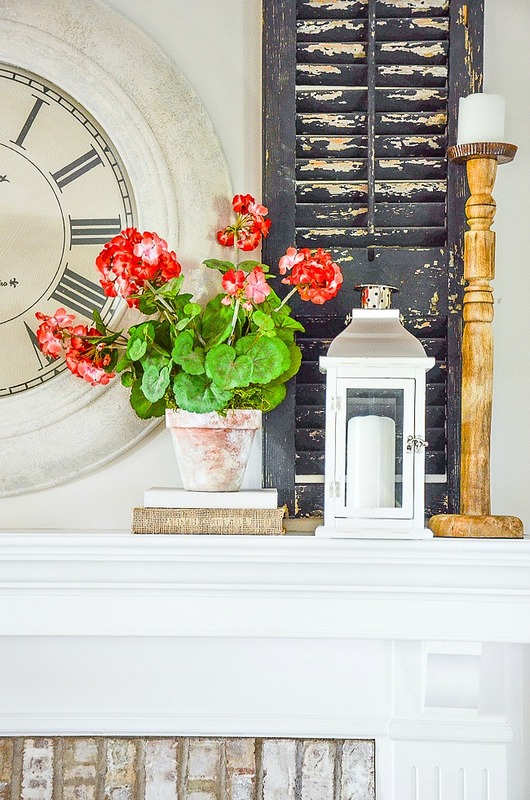 Although I don’t have any other red in my family room I used these bright geraniums to call attention to the mantel. How fun for summer, right? Don’t overcrowd a mantel. Keep it light and uncluttered. And remember bigger is so much better than lots of small items that don’t show up! 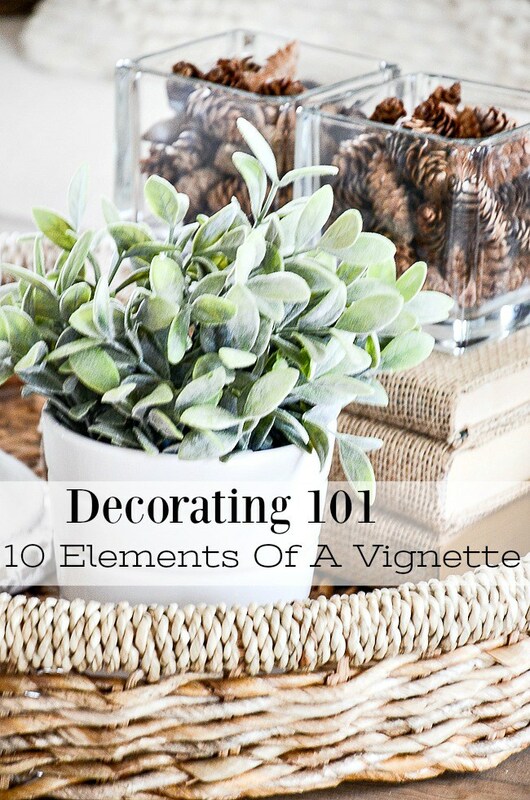 Think… “little vignettes” or groupings! I’m not one to spread the decor from one side of the mantel to the other. I much prefer groupings that incorporate the elements that make a mantel attractive. Especially in the summer, keep things light! When a mantel is finished, think again. Or should I say look again. 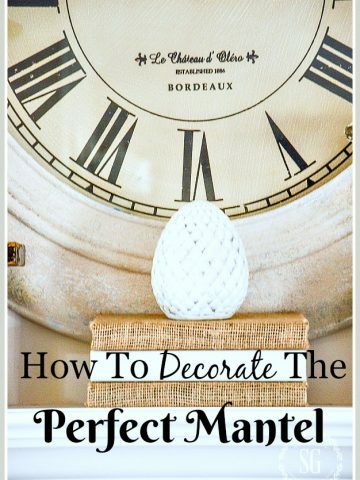 I’m a professed overdecorater so I need to take a step back from a finished decorating project and see if taking something away would make it look better. Or would giving the mantel a little more rearranging work better for my room? Always give anything you are decorating a second look and a little editing! Now, go shop you house and create a pretty summery vignette! Where did you get your jute rug??? What brand is it??? Thank you for giving me permission to have just that one pop of color on the mantel! I’ve always wondered if I needed to incorporate the color some other place in the room…and just didn’t want to! I feel so much better!!? 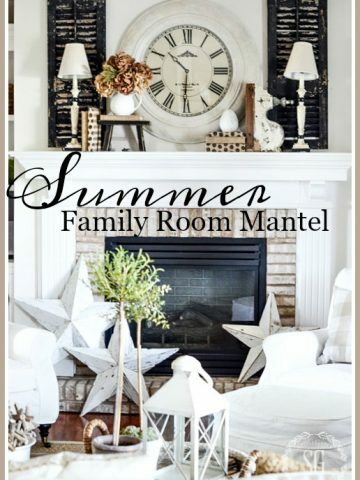 You summer mantel looks great! 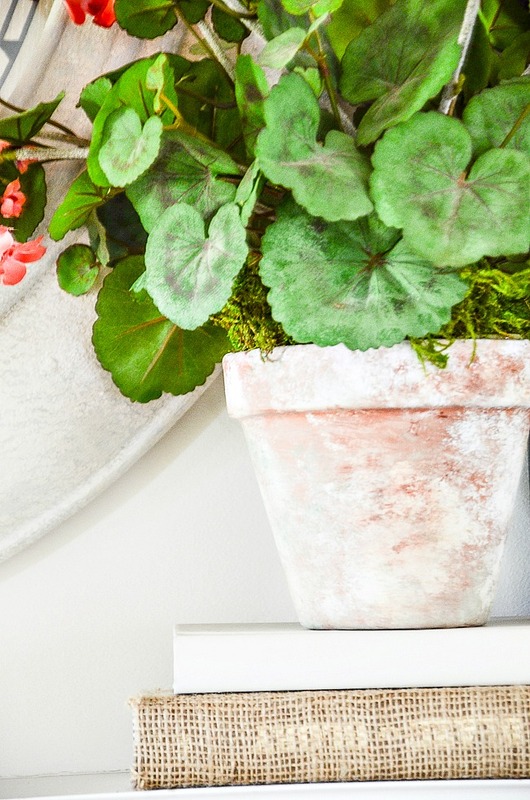 I absolutely love the geraniums – beautiful! 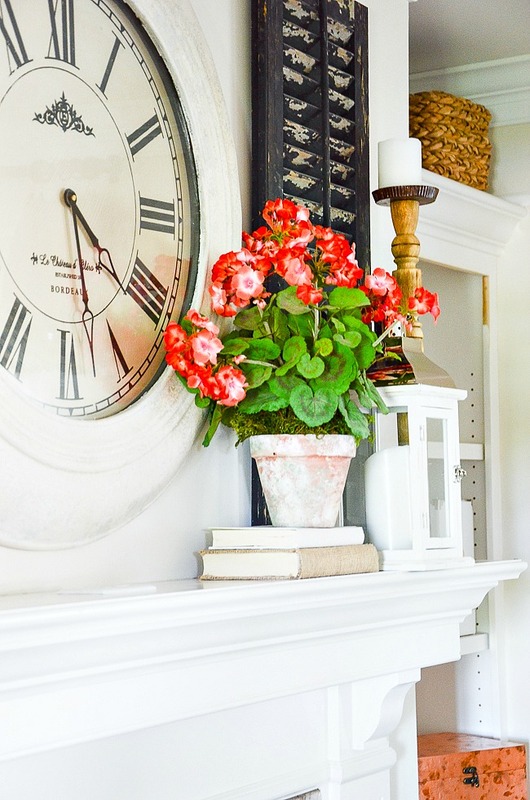 Unfortunately I don’t have a mantle but I do shop my home when the seasons change.If something doesn’t work,I get out the spray paint to change it up.I also love geraniums real and faux sprinkled in .Love your geranium on the mantles summer. Always love seeing your pretty mantel decor Yvonne! Pretty soon I will be decorating a new mantel in our rental home…dreaming about the mantel in our “right sized” home! Have a beautiful day!! What a beautiful mantle! Love the geraniums. My mantle looks too wintery now that I’ve seen yours. Will keep in mind your suggestions as I look to remedy mine! This was so helpful as I have been staring st my mantle wondering what I should do for summer. Now I know thanks to this post! I love learning your helpful suggestions!